The next two days were pretty much low key and mostly uneventful. I mean, yeah I was definitely experiencing contractions consistently, having to stop, breathe, and remember to be grateful for this process that was assisting me in giving birth to my baby. But there was nothing extreme going on, thankfully. I spent that time walking, lying around, talking about worldly events with others, eating and drinking well, and just…waiting. My mom had flown in earlier in the week, so she helped me manage. Then, Monday had come. My mom was scheduled to fly out that day and still there was no baby! * Well, I had an appointment in the afternoon. The doctor had told me that if I still hadn't delivered by then, I should make it to that appointment. I had considered not going. Thankfully I did. We got to the appointment later on only to learn after a brief examination that I was dilated 7 cm and my water had broken. It hadn't been clear to me that the latter was the case, since I wasn't experiencing too much in the way of fluid coming out. (When I think back on it, though, I think the amount was significant enough for me to have had some clue.) The doctor predicted that the baby was probably going to be born within the next 2-3 hours, so she insisted that we get to the hospital asap. She called an ambulance! Now, given how much I like peace and calm, the thought of being rushed to the hospital via ambulance had me tense. All that siren noise and frantic behavior of the paramedics was not my idea of how things would go. I know now--for sure-- that plans don't always hold up. View from up at the clinic where I received prenatal care. 4 or 5 months pregnant. So, she called the ambulance over, and we prepared to head down and load up. It was at this time that someone--perhaps a child running wild down in Pediatrics--pulled the fire alarm causing everyone to have to evacuate the clinic. Drama. We made it outside, and they put me in the ambulance and hook all sorts of cords and monitors to me. They even put an oxygen mask on my face. I was back there looking at the lady like, "Am I dying or having a baby?" As long as she wasn't trying to put any substance or anything in me, I let her do her thing. This was mainly why I had hoped to not have to deal with the medial establishment for my delivery. All the actions they feel they need to take "just in case"--even when you're not high-risk or have no problems--can be overwhelming and stressful. But, we were on our way. I have to give it to the lady driving the ambulance, though. She navigated that traffic like a pro, making cars get over left and right. A trip to Honolulu that could have possibly taken over an hour via car from way out in the boondocks where we live took us about 25 minutes. That's definitely what an ambulance is good for. So we made it to the ER at the hospital, and I was ready to hop up off the gurney and walk right on in. I felt pretty good, and despite how noisily my transportation had arrived, there was no panic in the back of that vehicle. As a matter of fact, I remember wondering why they hadn't just dropped me off near the labor and delivery entry. Ha! I wasn't considering my situation an emergency at all. I mean, what was all the hoopla about? The baby's head hadn't emerged or anything. 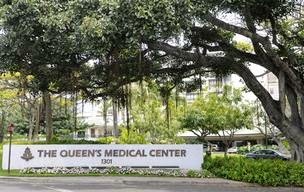 I chose to give birth at Queen's in Honolulu because of its legacy within Hawaiian culture (a culture which I respect as a newcomer to the island) and also because I love the lushness all around. Well, the EMT lady let me know quickly by her actions that, no, you are not climbing down out of this vehicle, no, you are not walking into the hospital on your own, and yes, we are going to put you in a wheelchair and wait for a nurse to come tend to you before we leave. I was looking at my man with protest in my eyes like, "…but I feel fine!" It was such a trip, but they did their jobs well. That was my first time ever being in an ambulance, and this would be my first time being admitted to a hospital for anything. Ever. *My mom, hoping that baby would come closer to the due date, planned her trip having no way of knowing that, actually, baby would arrive five days after the projected due date. Her flight left around 2 pm the day I was rushed to the hospital, but she'd left for the airport at 10 am, hours before my appointment. Until I got settled into the hospital at 2 something and we texted her, she had no idea that as she was boarding the plane to fly back to Louisiana, I was about to have the baby. Or so we thought.